The Piazza Bocca Della Verità (Mouth of Truth) is just across the Tiber River from the Trastevere neighborhood via the Ponte Palatino, just a short walk southwest from Campo dé Fiori, south of the Foro Romano (Roman Forum) and the Colosseo (Coliseum). 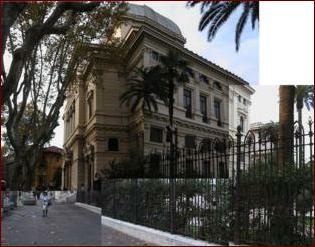 Here we found two echoes of ancient Roma: the Chiesa di (Church of) S.Maria in Cosmedin and the Circo Massimo. The Chiesa di S.Maria in Cosmedin is an austere medieval church, best known perhaps for its six-story tower of tiny windows and thin columns. Colored plates, porphyry discs, are stuck into the façade. The altar is an ancient Roman porphyry bath. Porphyry marble, its dark purple salami color much in demand, became unobtainable when the mines ran dry in 100 B.C. Items made since then have been carved out of older porphyry sculptures. There was a separate gallery for women to worship in private. 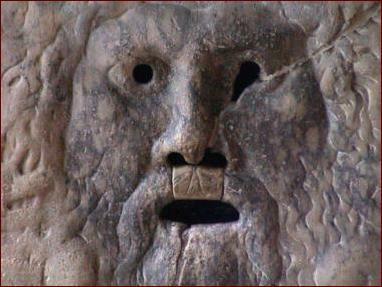 La Bocca della Verità (Mouth of Truth), from about 100 B.C., is a giant marble disc sculpted into a human face. It was originally a sewer cover in the adjoining ancient temple dedicated to Hercules. Traditional lore holds that if you lie while your hand is in the sculpture's mouth it will be bitten off. Legend has it that a priest used to hide behind the marble face and whack the wrists of known liars, making them yelp with pain. We've also heard that he used a scorpion. The Circo Massimo (Circus Maximus) was a racetrack, occasionally used for mock battles and hunts. Built in the time of the Etruscan kings (in the 6th century B.C. during the time of the Tarquins), the brick structure was adorned with an imperial stage by Augustus, was rebuilt by Trajan, enlarged by Caracalla, and restored by Constantine to hold 320,000 people (about one-third of the Roman population). Now only an oval basin almost completely filled in with dirt remains, with the spina, the long barrier which ran down the middle of the track, visible as a raised berm. The spina was decorated with a variety of statues, columns, obelisks, fountains, and two temples. One had seven eggs, the other seven dolphins. Upon completion of each lap (of the seven-lap race) an egg or a dolphin (representing one of the two competitors) was removed, allowing the crowd (and the racers) to keep track of the progress. In the Circo Massimo men and women could sit together, unlike in the amphitheaters. There were luxury boxes for the priviledged classes. The Circo was twice destroyed by fire, once in 64 A.D. (rebuilt by Nero), again in Domitian's time (rebuilt by Trajan). Twice the stands collapsed with great loss of life. In 549 A.D., nearly a millennium after its construction, the last race was held in the Circo Massimo. Done with this part of town we turn around, walking the Lungotevere Pierleoni along the river. It's not a long walk to synagogue, shown here, at left. It's hard to see the two armed police in front of the building. They were a sad, clueless lot. They didn't seem to realize that the synagogue they were guarding was open, but that the entrance was in the back. It was Friday afternoon, and we'd planned on being here to participate in sabbath services. We continued to the side of the building, past the anti-terrorist crash barriers, to the rear entry. A squad of police was checking those requesting entry. Our bags weren't allowed in, so we took turns guarding our pile of backpacks (not that we really were worried about someone taking them under guard; we were more worried about scaring the police). The interior of the synagogue is just beautiful; several stories of Sephardic (Mediterranean/African Jewery) architecture. Services were just starting, and Isaac was outside, so we only spent a short time enjoying the melodies and fine dress of the congregants. We were getting good and hungry, so (skipping the kosher full-service restaurant because it was closed) we visited a pizzeria in the Jewish Ghetto, the neighborhood directly behind the synagogue. Sardine pizza. Excellent. Then we stopped at a café next door, had another caffè macciati caldo, and returned to the river. A few blocks north, at the place where we see the plants overhanging the street, we turn toward the Campo dé Fiori and home. To sleep, perchance to dream.